LtoR: Don Beistle, Jeff Rapp, Dean Graves, and Jim Betts. 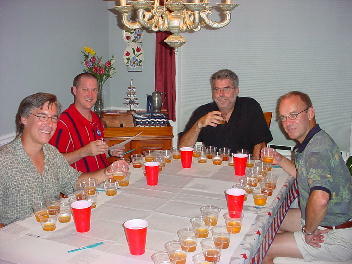 Owen Ogletree (director of Brewtopia Events LLC) gathered together fellow beer lovers Don Beistle, Jeff Rapp, Dean Graves, and Jim Betts on July 10, 2004 to sample and comment on several Bohemian Pilsner style lagers. This sampling was done as a blind tasting where no one was aware of the brands that were being served. Products were informally commented upon and ranked according to Beer Judge Certification Program (BJCP) style guidelines. First, second, third places, and honorable mentions were awarded to the products we felt represented their individual styles in extraordinary fashion. Drop Owen an email to share your comments and opinions. Click here for the full list of all our past blind evaluations and tastings of commercial beers. Click here for the full list of Brewtopia Events beer destinations with information and photos from the best beer places in cities around the world. Aroma: Rich with a complex malt and a spicy, floral, Saaz hop bouquet. Moderate diacetyl acceptable. Appearance: Light gold to deep copper-gold, clear, with a dense, creamy white head. Flavor: Rich, complex maltiness combined with pronounced soft, rounded bitterness and flavor from Saaz hops. Moderate diacetyl acceptable. Bitterness is prominent but never harsh, and does not linger: The aftertaste is balanced between malt and hops. Clean, no fruitiness or esters. Comments: Uses Moravian malted barley and a decoction mash for rich, malt character. Saaz hops and low sulfate, low carbonate water provide a distinctively soft, rounded hop profile. 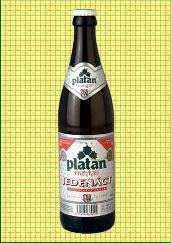 Ingredients: Low sulfate and low carbonate water, Saaz hops, Moravian malted barley. 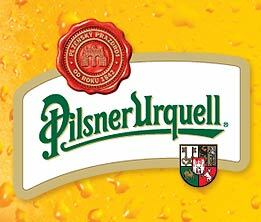 Commercial Examples: Pilsner Urquell, Gambrinus Pilsner, Budweiser Budvar, Staropramen. Aroma: Mild hops, malt, and a hint of fruit. Appearance: Clear and golden with appropriate white foam. Flavor: Nice medium body with a great balance between malt and hops. This beer is not too bitter, but hops are present and very elegant in taste and flavor. Hops are very pleasant and floral. Aroma: Slight butterscotch. Big hop aroma. Flavor: Malt background is rich, and hops have a wonderfully aggressive finish. There is slight butter complexity in the flavor. This lager has a robust malt and hop character that lingers in the aftertaste and has notes of vanilla. Aroma: Very subtle aromas of malt and hops. Slight metallic hint in aroma as well, along with a touch of fruit. Flavor: Nice grain flavor. Toasty with some honey notes. Hops seem a bit metallic in nature. A slightly sweet lager with hints of vanilla. Balance here is toward malt -- more Saaz hops would be nice. Delicious and very drinkable. Aroma: Light and very mild aroma of malt and hops. Flavor: Dry and clean with a slightly bitter (but not spicy) finish that is appropriate. Hops seem a bit metallic. Overall, this fits the style well and is pleasant. Aroma: Butter, cream corn -- not appropriate. Appearance: Golden with a very light, soft carbonation. Flavor: Slightly tart and dry. Body has a good medium mouthfeel. Aroma: Slight butter and fruit. There is not much aroma at all. Flavor: Has a fruity flavor (not appropriate) more like a clean, golden ale. Not very bitter at all -- could benefit from more hops. Aroma: Hops have a citrus character. Hop aroma is more like spicy, resiny, American hops (not Bohemian Saaz). Appearance: Very pale gold in color. Flavor: Soft, medium body. Flavor is dominated by hops. The hops used here are too biting and rough for a Bohemian Pilsener. More like a very light American Pale Ale. Aroma: Hint of skunk from light entering the bottle. Appearance: Clear and golden with appropriate white foam.. Flavor: Slightly sweet and fruity. Needs more smooth hop character to be within this style. Aroma: Hops are very floral and malt aroma is like honey. Very pleasant. Appearance: Very dark gold in color. This was the darkest of all the beers on our table. Flavor: Too malty for a Bohemian Pilsener. This beer is very creamy with a big body -- it is a bit too thick, malty, and caramel-like for this style. Aroma: Very subtle aroma with slight malt and hop notes. Flavor: Slight corn. Not very bitter or malty. Has very pleasant, mild flavors, however. Seems like a lighter version of this style.